On Monday morning June 19, I walked into the Minnesota Historical Society (MHS) to begin the formidable task of cataloging the negatives of the Arthur Jensen Collection. I was told there were 13,500 images to catalogue and I had no idea just how many I could review in a day. Kim Jeppesen, a member from St. Paul, had already prepared a data sheet form for me to use to record all the necessary information about each image. This made the task much simpler, as I could just jot down the proper code number for most of the information about each negative. I did learn that although the Arthur Jensen Collection goes from No. 1 to 13,500, not all numbers are there. So, there are somewhat less than 13,500. But I also learned that there is another collection of color negatives, which seem to cover a time period after the period when Jensen was the official photographer for M-M. This second group begins in the late 1950s and contains 2,000 to 3,000 negatives. The Jensen Collection begins in 1936. I worked two days and got as far as number 740, which took me to late 1937. Probably less than half of the negatives really need to be printed, because there are quite a few very similar views taken during a given photo session. There are also quite a few “boring” views of things like individual components of implements, etc. If you look through a piece of sales literature and notice all the detail shots, you will realize what I mean. But then there is the good stuff! 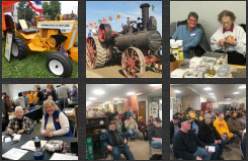 Wonderful views of tractors like 21-32, KTA, MTA, JTU, JTS, JTO, YT, ZTU, ZTI, ZTA, FTA Industrial,just to name a few. Many of the views were images that I have never seen before. Of those 700 plus images that I have looked at so far, I have a list of about 80 which I am going to order for my personal collection. The greatest part of this project is that once the images have been catalogued, anyone can order prints for themselves! I would like to make a few comments about the Arthur Jensen Project. One of the most frequently voiced questions that I have heard since this project began is: Why not let the Minnesota Historical Society (MHS) preserve these negatives? That is a good question, and quite frankly the answer is the MHS has neither the money nor the time to take care of these negatives. During the last trip that some of the board members made to the MHS, it came to light that there are a number of groups such as ours who are raising funds and donating time to accomplish similar projects. The bottom line is plain and simple: If these negatives are to be saved, it will have to be done by Minneapolis-Moline enthusiasts! The Jensen Project gives us all a chance to not only continue our own collections, but to preserve a collection at another level. By restoring the Arthur Jensen negatives, we are saving a priceless collection not only for ourselves, but also for future generations. Many will say, if I do not have the time to go to the MHS, why should I donate? Let me offer one example. In the past year there have been a couple of excellent books regarding MM that have been published and are now on the market. Good books require good text as well as good pictures. The sheer volume of prints available in the Jensen project could supply material for many books in the future. I am especially impressed with donations that have been received so far from people whom I have never met, and don’t even recognize their names. They see the importance and value of this project. I would encourage those of you who have not yet become involved, to do so. This is the type of project that we as collectors are all about. I want to also remind you that running this project account through the Collectors Club, which is a non-profit organization, makes any donation tax deductible. Thank you for helping to save a priceless collection for eternity! Editors note: Since this article was written, the Jensen Fund Raising campaign has ended. Please check the President’s Report for updates on the project.